If you travel to New York in November and / or December, I invite you to see the holiday windows of New York city department stores. I'm sure both children and adults will enjoy these magical displays. The windows are decorated by real artists, adults appreciate their work and the kids will be amazed by the colors and animations. It is one of the most famous stores in NY. During this holiday period, thousands of people come to see its Christmas decorations. - Decorations change their theme every year, and for 2018, Macy's windows are all about "Believe In The Wonder Of Giving" to represent the spirit of the season, the joy of sharing with those we love. If you go to Macy's, come into the store to see the big Christmas tree and a fifteen foot tall representation of Santa Claus above the marquee entrance! Address: Herald Square, Broadway Between 34th and 35th Streets, NYC. When: You can see the window display until January 1, 2019. Saks Fifth Avenue is another department store in New York. - 2016: "Land of 1000 Delights" a colorful display in a world of candies! On the 5th Avenue, you'll see the "Nutcracker Sweet". - 2017: celebrated the 80th Anniversary of "Snow White and the Seven Dwarfs"! - 2018: it's show-time with the theme "Theater of Dreams"
When: The extravaganza will play daily from 5 to 11 pm every ten minutes until January 2, 2019. If you want to see modern displays in New York, this one Is for you. It always have a humorous touch by using objects that are not common for a Christmas decoration. Last year's was more social/political, part of a new tradition maybe . The theme in 2016 was "Love, Peace, and Joy" in very creative interpretations and the presence of the characters of South Park to celebrate its 20 years on TV! 2017 was a social campaign themed displays by the Haas Brothers! The messages are identified as #HaasRules: "Primordial", "Utopia, "Millennium", "Mushroom Singularity". The Flagship Store (Downtown) reveals a message "Snake Love, Not War", even the inside staircase is decorated with a vibrant snakeskin print! 2018 keeps the tradition with a "Make Change" theme, in partnership with the association "Save the Children". When: Until January 1, 2019. On 5th Avenue, south of Central Park, these windows displays are very sophisticated and have great style. They are true works of art, clothes and fashion accessories are added. Every year they change the theme. In 2016, Bergdorf Goodman took you to "Destination Extraordinary"! A magic wonderland as The Winter Garden and Bird's Eye View! 2017 windows were entitled "To New York With Love", celebrating New York's world-renowned cultural institutions, magical! 2018 will make happy candies fanatics, the theme is "Bergdorf Goodies". Candies, cotton candie, chocolate cakes... are there! When: till January 3, 2019. 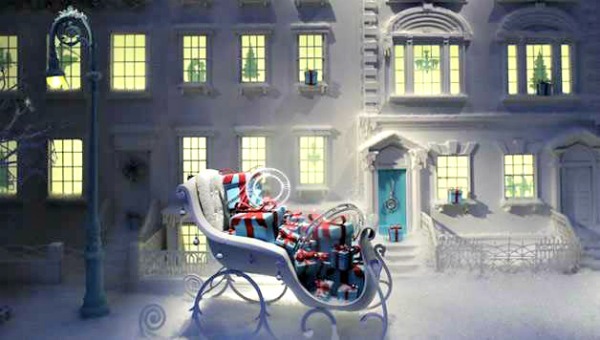 The Christmas windows of Bloomingdales store are some of the most famous in the city. They are well known for their detail and elegance. In 2016 the eight windows displayed unique chandeliers of visual artists like Inma Barrero, Erika deVries and Jonah Meyer to just name a few. You'll understand that the theme of the year is "light" 😉 The chandeliers will be auctioned off for the Child Mind Institute. The window displays were unveiled on November 21 with the theme "The Greatest Showman". 2018 is about The Grinch and Dr Seuss! When: Till the first days of January 2019. On 5th Avenue, near the big library in New York, you can see this shop with traditional Christmas decorations. It is an amazing place! 2016: You werere invited to an "Enchanted Forest" made of lights and vibrant colors! The theme for 2017 was "The Best and the Brightest", marking the 80th year for the Lord & Taylor holiday windows! In 2018 the theme is about the famous brand Lord&Taylor that will disappear in 2019!! The jewelry Tiffany & Co also usually makes a very special decoration for Christmas, with many small details. This year the theme is "The Holidays Made By Tiffany" with a series of scenes that pay homage to Gene Moore. Address: Tiffany & Co., 727 5th Ave, New York, NY 10022. When? : until January 1, 2019. 6 responses to the post : " Christmas and Holiday Windows at New York Department Stores "
Is there a rough guide as to when any of them are unveiled? They are unveiled by November, it depends on the stores. As soon as the info is official I'll update my post. Are the windows usually decorated by the weekend before Thanksgiving? Usually it starts that week. How long do the windows stay decorated at Macy's?